Over coffee and donuts, the clergyman and Coyote discuss the nature of the universe. 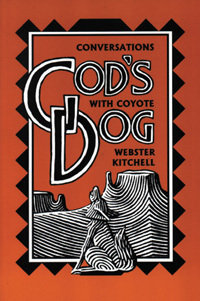 Discussions between a philosophical clergyman and Coyote, a minor deity of the southwestern United States, are both stirring and playful. Over coffee and donuts, during desert drives in an old VW Thing, they playfully banter about such matters as death, lying, why Jesus was crucified, what money will buy and the nature of the universe. Coyote came into my life unbidden, unwanted, un-yearned for. I had given up on God. I was living my life, and God was doing whatever God does. Perhaps I was understood by God, but I had accepted that I was never going to understand God. Surprisingly this made no difference to my being a parish minister. Most of the people in the congregation had also given up trying to understand God. They would have been content to understand their children. So we worked together on such things; on understanding ourselves, our mates, our children, our society. We worked on that with an eye to becoming more human, more humane. That seems a good set of things for a little church to be doing. It might have been what God was wanting us to do all along. So I was surprised to have Coyote enter my life. I met Coyote shortly before dawn on the summer solstice. There are coyotes, and there is Coyote. I met a coyote that morning in the desert, but before the day was over, I met Coyote, the Trickster. That’s what happens when Coyote is around. It was at Ghost Ranch, near Santa Fe, New Mexico. I was to meet some people and hike to Chimney Rock to greet the sun on the solstice. I overslept, as is my custom. Hurrying along a trail in the pre-dawn light, I caught a coyote out of the corner of my eye. She or he was on a cross-trail to mine. We saw each other at the same time. We stopped and looked into each other’s eyes. It seemed to me we held the gaze for a long time. Then the coyote trotted across my path, headed home after a night on the mesa. I went up the trail to the sunrise. All day that summer solstice day the coyote’s gaze was in my awareness.